The heads of European Union states will deliberate whether to extend sanctions on Russia and it is very important that this would be done because the situation has not changed whatsoever in three years, President Dalia Grybauskaitė told LRT Radio. "We are talking about sanctions which limit and limited lending to Russian banks and companies in the tech and oil sectors, a weapons embargo. The sanctions are certainly working and are very serious," the head of state stressed, LRT.lt writes. The president explains that the meeting will feature a large number of discussion points and while the Christmas atmosphere could lighten the mood, there are always many very serious questions – defence, Brexit processes, strengthening the Eurozone and sanction extensions for Russia, as well as cyber security response forces. The president observes that Lithuania alone experiences 50 thousand cyber-attacks per year, necessitating the formation of such a response force and this question has been included into the group of priority projects namely at Lithuanian initiative. The president also points out another matter that has been placed on the agenda at the initiative of Lithuania, together with partners, namely a military variant of the Schengen Area, which would simplify the movement of troops through member states, if the need arises. This project has also been included into the group of 17 priority projects. In the military dimension, the meeting is to also feature meetings with the NATO secretary general Jens Stoltenberg, where EU-NATO cooperation will be discussed. D. Grybauskaitė emphasises that the aim is not to duplicate functions, but contribute to NATO in the fight against hybrid threats, terrorism and also to aid third countries. "European security and defence policy must complement and take up niches that NATO has not taken. Mainly it is in new, modern threats," she said. Regarding Brexit negotiations, the president explains that the results of the first round of negotiations will simply be reconfirmed. There are four matters that have been agreed upon and D. Grybauskaitė affirms that the rights of EU, hence also Lithuanian, citizens will be protected, as will UK financial commitments. "These are two major achievements at this stage. Another, third question was very important and sensitive – the border with Northern Ireland. Fourth – the influence and authority of the Court of Justice in the UK during the interim. 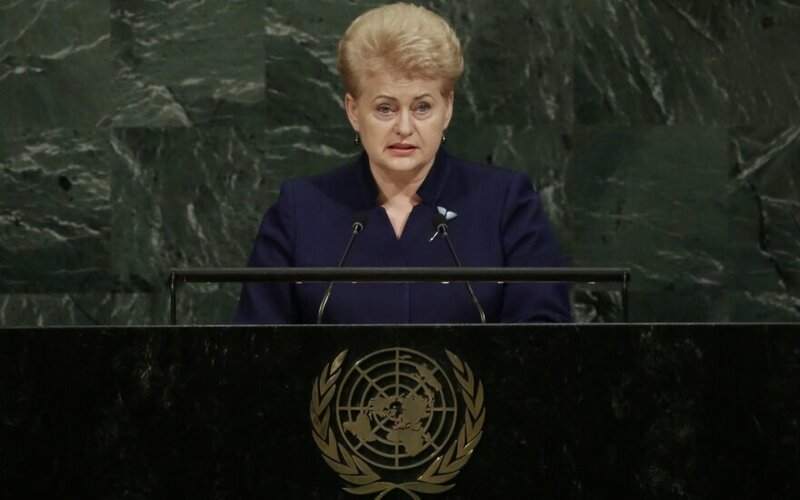 These are four things that have been agreed upon and suit both sides," D. Grybauskaitė explained. She notes that she believes that the results will be confirmed and the main discussions will revolve around the second stage of negotiations which will be aimed at the future EU-UK relations after Brexit. This includes trade, domestic affairs, security and such. President Grybauskaitė observes that the second stage of negotiations over the future relations model may be more difficult than the first one, considering the unprecedented nature of the situation. "The UK is a very important partner for Lithuania, as it is for other EU countries. We trade intensively, our export exceeds a billion euro, not to speak of how the UK is also an important security ally. We are seeking the future relations model to be beneficial to both sides, not weakening, but strengthening all of us. We will have to seek compromises, they will not be easy, but no-one has ever tried such a variant and nobody knows what it will look like," the head of state said. While the negotiations are formally aimed at lasting two years and concluding in spring 2019, D. Grybauskaitė notes that if an agreement is not found by then, the date could be extended. Nevertheless she points out that it has been agreed that by the end of 2020 the UK will have fully financed its commitments, thus no matter the outcome, it should not have an economic impact, bar that due to the political instability which could appear. Regarding an extension of sanctions for Russia, she stated that, "I truly hope so because these sanctions, which expire on January 31 are linked to very specific conditions, namely the implementation of the Minsk agreement. While three years have passed, the situation has not changed at all and we see no shifts, for now Russia is not upholding its commitments, we see military action in Eastern Ukraine, thus I truly hope that the sanctions will be extended for another six months. President D. Grybauskaitė emphasises that the sanctions have had an impact and are very serious, furthermore the impact they have is not just economic and political, but also acting as an expression of EU political position regarding the actions Russia has been taking in Ukraine.